A thin omelet can be used to hold your fixing like a tortilla. This guide is about how to make egg tortillas. 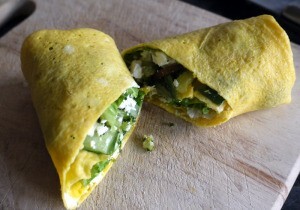 Making your own egg tortillas is easy and they make a pleasant change from wheat or corn. They are also useful if you are on a diet. Simply heat a large frying pan with a little oil. Beat an egg well with one tablespoon of water and a little light seasoning. Let the egg spread out in the pan to make a thin omelette. Gee, I never thought of that but I glad that you did. I do need to have protein with most meals. The corn and flour tortillas have lots of carbs. There are some low carb tortillas but not the same as the regular. This wrap would work well with lots of other food that can be wrapped. A breakfast taco M--mmmmm wrapped around bacon tomatoes and cheese with salsa. What a terrific idea, Shirley! Thanks for posting. I'll also be trying it with egg whites and perhaps some hemp seeds for veg-based protein. No end of possible combinations!